This is the place to discuss all things related to the Preston North End v Swans - Championship game on Saturday 12 January 2019. Share your pre and post match thoughts, views on Graham Potter's pre or post match comments, team selection and score prediction! The referee for the game is Keith Stroud. If you are going to the game have a read of our Travelling Jacks Guide to Deepdale - the home of Preston North End. Have a browse of the Preston v Swans Head to Head stats from their first meeting in 1925, right up to the last time they played at Deepdale in 2011. Anybody know the last time we won three away matches in a row on consecutive Saturdays? Probably never. It seems to be the new thing in the Championship, two home matches then two away, with cup matches sandwiched in between. Well Saturday is the chance to win this third game. Hopefully Mr Potter has learnt from the Wigan game and fields an unchanged side. 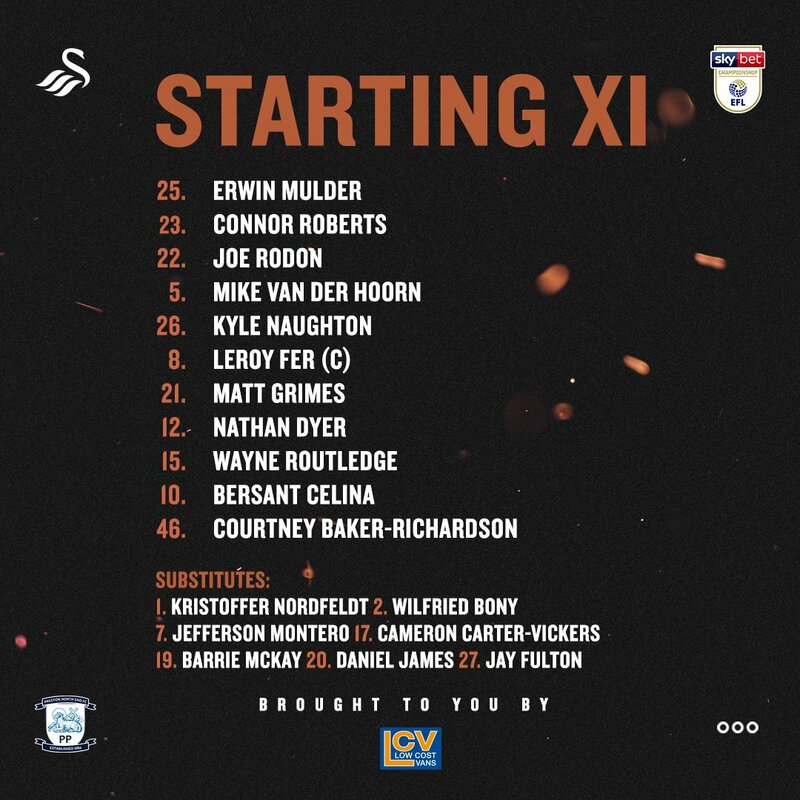 Hopefully McBurnie will have shaken off his illness and will come in for CBR as the only change. Living near Preston so it's a "home game" for me - going with 2 of my lads, so here's hoping for a good performance and 3 points. North End are a strange one - had a poor start, really picked up, but then returned to a bit of inconsistency. They really can be a force at home though, so the boys will need to be on their toes. First ever Swans match for me-- at Deepdale in season 50/51.With my Dad as a 5 year old when we lived up that way.Obviously don't remember too much other than being in a crowd and Dad pointing out Ivor Allchurch and Tom Finney.Also that Preston won.!! Hopefully tomorrow will be more positive for us. I'd settle for a nice 2-0 away win again. He has predicted in 21 of our games so far this season, and got only 10 right - 2 of them 100% spot on. the 2-1 win vs Wednesday, and the 2-1 loss at Derby. But he has picked us to win 10 of those 21 games, with 1 draw. Of those 10 wins, we actually only won 4 of them. we lost the draw (Home to Villa). He had us down to beat Ipswich, we lost. 1-0 home to Bristol. we lost. Predicted we'd beat Rotherham 2 nil. we lost 2-1. But predicting our results so far this season really is a stab in the dark, we have been that inconsistent! it will be a test on how far we have improved in dealing with the hard press, as Preston are apparently injury free after having a period with key players out. Also interesting to see if Fer can show the consistency his manager (and critics like myself) has said he is looking for. Probably means GP will make 6 changes! Jeff back on the bench as well. You know it's gonna be 1-0 to Cardiff with a late spawny goal. 0-0 HT Better side but CBR not offering much. Perhaps Bony to come on after an hour. Fer playing well but shouted in the ref's face a couple of times and needlessly booked for this just before half time. Need VDH as capt. Roberts playing well again out of position. Celina showing great flashes of skill. That is so unlike Fer, getting booked and then keeping on having a go at the ref! I thought you were supposed to set an example as a captain? CBR scores - huge part played by Wayne Routledge!! Fantastic work from Routs in the build up. COME ON U SWANS. STID. Never a pen. Hit Connor on the hips. Well say no more, the refs in this div, utter shite. Bony on for CBR. Jeff or Dan on for Dyer, please. Fer looks fudged as well. Losing the middle. Need Jay on. PNE down to ten. Second yellow for Earl. Cardiff 2 shots (none on target) v bottom side.